Blackmagic Design has already had a busy year with the release of several new products including the URSA Mini Pro and DaVinci Resolve tools. Now at NAB Show, they have some more announcements to tantalize us with. The release of DaVinci Resolve 14 addresses some major concerns from the last release, namely performance speed and audio. According to Blackmagic this latest release is 10 times faster than previous releases improving responsiveness and fluidity of operation. As for audio, DaVinci Resolve 14 builds in Fairlight audio on its own new page in the software and it now has the ability to play back up to 1000 tracks with parametric EQ, dynamics and plug ins on every track, in real time, when used with the Fairlight Audio Accelerator card. 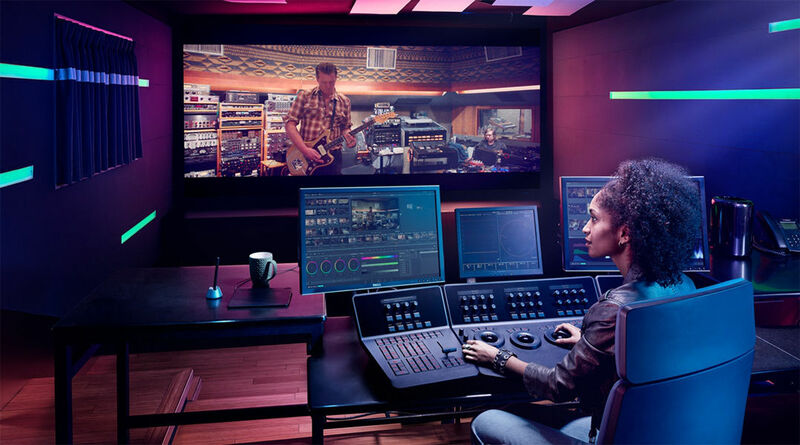 Finally, the new DaVinci Resolve 14 also integrates workflow collaboration tools that make it possible for a team to edit, colour and do audio post production on the same job, at the same time. 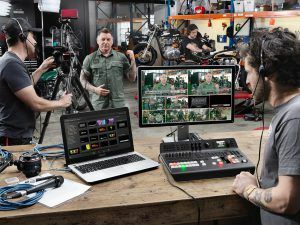 Earlier this year, Blackmagic launched the ATEM Television Studio HD production switcher for broadcast, professional and AV users. 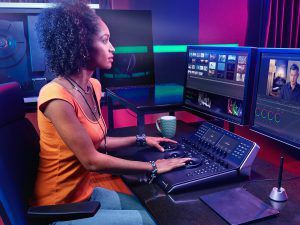 The just announced ATEM Television Studio Pro HD shares all the same professional features as the Studio HD, but is now integrated inside a professional desktop mounted control panel. The Studio Pro also gives you a full CCU control area on top of the control panel giving operators control over multiple cameras. There is also an integrated hardware control panel featuring 4 HDMI and 4 SDI inputs letting you work in all formats up to 1080p60. 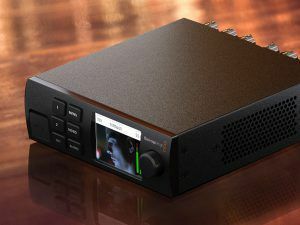 The ATEM Television Studio Pro HD is expected this May. When Blackmagic released the URSA Mini Pro earlier this year, they kept one key feature a secret. Now, the secret is out. The URSA Mini Pro supports Bluetooth connectivity! Holding this information back until their iPad app for URSA Mini Pro was ready, operators will now have full remote control over camera settings and metadata entry. Best of all? Blackmagic has decided to open the protocol up to developers so they can use the API to customize their own control solutions. 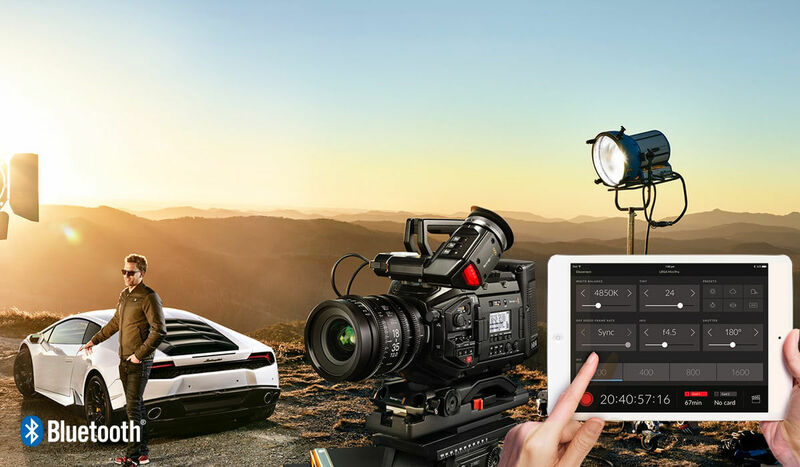 The open API will let you build applications to remotely adjust camera settings, control the built in DaVinci Resolve colour corrector, add metadata, sync cameras and more. The app should be available this May, but if you’re at NAB Show you can see it demonstrated now. Video Assist 2.4 adds support for localized interfaces in 10 different languages including, Chinese, English, French, German, Italian, Japanese, Korean, Portuguese, Russian, Spanish and Turkish. Blackmagic has also added new professional scopes to the Video Assist 4K model including waveform, RGB parade, vectorscope and histogram that can be used in full screen, as an overlay on top of incoming video or as Picture in Picture. The Video Assist updates will be available to Video Assist 4K customers in June as a free software update. 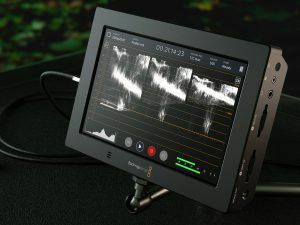 Users will find that Blackmagic added some new connections, but at the same time, removed some as well, namely analog out. Powered by Thunderbolt, you can set it up just about anywhere you can take your laptop as it will draw power from that. Add in the optional Teradex Mini Smart Panel to get video, audio meters and status including a new frame buffer indicator to help evaluate disk performance on broadcast systems. The UltraStudio Mini HD includes 3G-SDI and HDMI outputs and 3G-SDI, Y,Cr,Cb analog component or NTSC/PAL inputs.